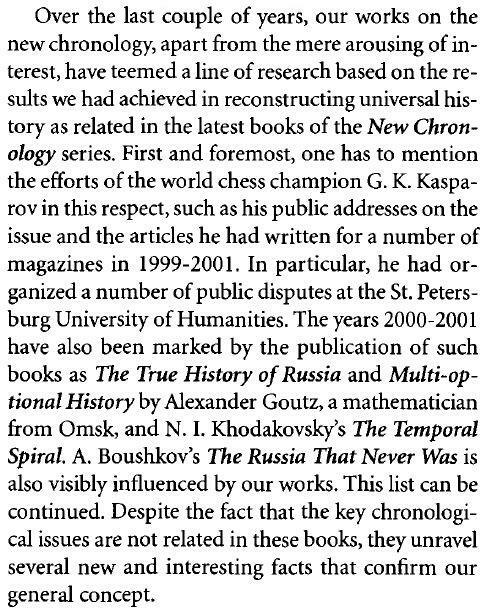 Information is wanted on Garry Kasparov’s belief in, or espousal of, the theory of New Chronology (Fomenko). As in the case of Kirsan Ilyumzhinov and Aliens, our interest is solely in first-hand statements, i.e. 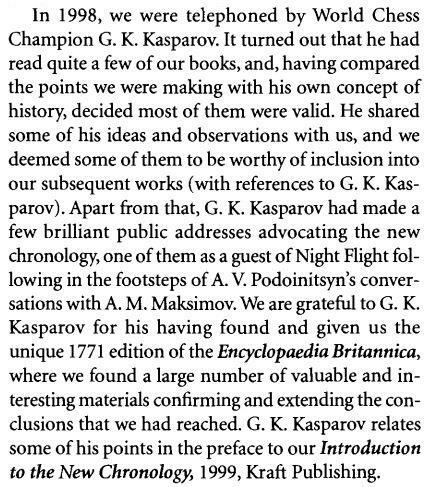 remarks by Kasparov himself, in the original Russian or English. Kasparov’s involvement in this fringe theory has seldom been mentioned in the Western press. On 24 April 2001 Warren wrote a follow-up article for the Telegraph giving more particulars regarding Kasparov and New Chronology and with several quotes. Internet searches offer some clues for further research. On 23 August 2010 Timothy Taylor posted on his website the transcript of a 2001 interview (“originally published in Saturday Night online, 2001”) in which he spoke at length with Kasparov about New Chronology. An essay by Kasparov, “Mathematics of the Past” , in which he espoused his theories on history, has circulated on the Internet. For some years it was available at www.new-tradition.org, an outlet used by New Chronology supporters which now seems defunct, but the full text of the essay is easily found elsewhere on-line. 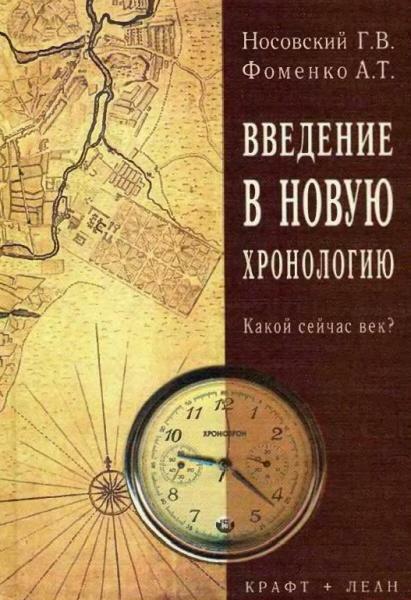 Vitaliy Yurchenko (Uhta, Komi, Russian Federation) draws attention to Kasparov’s Foreword on pages 10-28 of Введение в Новую Хронологию. Какой сейчас век? by G.V. Nosovsky and A.T. Fomenko (Moscow, 2001). ‘Garry Kimovich, I saw a television programme in which you supported the theories of Mr Fomenko. It would be interesting to know your estimate, as a professional chessplayer (nobody would challenge that), of how many thousands of years old the game of chess is (beginning with chaturanga). Does its age, six thousand years according to the most common theory, fit in with the chronology set out by Fomenko? And how are you going to run the State if your views on history are so original? Will you give Rus’ the previous name Horde? – Mikhail Evgenievich Levashov (Moscow). Olimpiu G. Urcan notes some remarkable statements by Kasparov in a 2000 documentary about him by Joël Calmettes, from approximately 45’00” to 52’00”. Addition on 14 January 2019: replacement link. Latest update: 19 January 2019.